This is a super easy recipe that is cheap and filling. The ingredients below form the basis of any Dahl that you wish to make. You can add to it, spice it up and generally make it your own through trial and error! 1. Heat the oil in a large pan over a medium heat. Add the onion and cook gently for 5 minutes. Add the garlic, ginger, red chilli and cumin and cook for a few minutes. taste and cook on a low heat for 25 - 30 minutes until reduced and thick. If you are feeling a bit more ambitious then you can get a pestle and mortar and combine the cumin seeds with 1/2 teaspoon each of coriander seeds, mustard seeds, 2 teaspoons of ground turmeric and 1 teaspoon of garam masala and add these to the onion mix as above. The dish can be finished with a squeeze of lemon juice and some spinach stirred in. Or when in season I love to steam some asparagus and lay it on top of the Dahl just before serving. Can be eaten on it's own or with rice, naan bread or poppadoms. This is a great recipe for using up left over potatoes, ideal for students! Goats cheese or other cheese. Boil the potatoes until almost cooked (15mins approx.) And then allow to cool. Meanwhile peel and slice the onion. Put the oil in a frying pan and heat through then add the onions. After a couple of minutes add the garlic and continue to cook. Be careful not to let the onion and garlic burn. Add the white wine (or you can use 2 tablespoons of dry sherry and the same again in hot water). Add the soft cheese (or you can use or cream or creme fraiche) and allow to muddle together. Slice your now cooled potatoes and add to the pan making sure they are well coated in onions and creaminess. If your frying pan goes in the oven then add knobs of goat's cheese to the top and bake in the oven at 190 for 15 to 20 minutes. If your frying pan does not go in the oven (don't melt the handle!) then transfer to an oven proof dish and place knobs of goats cheese and bake as above. ​Super- filling; super cheap and super yummy! Put chicken breast in freezer bag and taking a rolling pin flatten breast to make an escalope by gently hitting it. (This is also great for removing stress!) If you are too rough you will damage the meat. Repeat with the 3 other breasts. Dip each breast in the seasoned flour, followed by the eggwash and finally the breadcrumbs. I find doing this ahead of time and leaving the breasts in the fridge helps the breadcrumbs to stick when frying so great do do before work and come home to a "ready meal". Melt half the butter and fry half the chopped garlic until it just starts to caramelise. Leave to infuse. Melt the rest of the butter and cook the chicken breasts in a hot pan until they are golden brown on both sides. Then keep warm in the oven. Finish the garlic sauce by adding the rest of the garlic, more butter if necessary and some creme fraiche. Don't worry if the sauce looks curdled at first - keep stirring and it will come right. Serve with a slice of lemon to garnish. 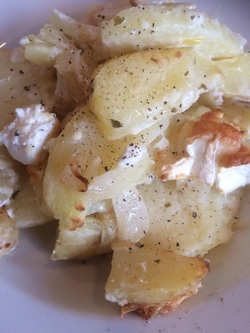 Little cubed fried potatoes work really well with this dish. For variation add parsley to the breadcrumbs. The original recipe I used was with plain flour, however I now use self raising as I think it provides a lighter bite. Mix all the ingredients together to form a dough. I always use an electric mixer to do this - makes it easy peasy! Add a pinch of salt if you like - I never add salt as I often use a blue cheese and parmesan can be quite salty too. Roll out the dough to 1/2 cm thick on a floured surface and cut out rounds using an old screw top from a (wine) bottle. You can re-roll the pastry 2 or 3 times to make maximum use. Place on a baking tray lines with parchment. Cook in a pre-heated oven 170 celcius for 8 to 10 mins or until they turn golden. Place on cooling rack. When cool store in an air-tight container. Keeps easily for up to 3 days, maybe more if you can resist the temptation to eat them! For variations add a sprinkling of cumin seeds or chilli or herbs to the rolled out pastry - fold and re-roll.